Christmas a time to celebrate! 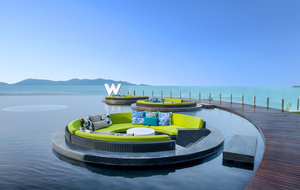 And there’s no better place to enjoy the festive occasion like W Retreat Koh Samui where the cheerful ambience is set amongst the pristine beach, picturesque sea views, coconut trees, bright sky and edgy-designed spaces. On the following day, celebrate Christmas Day Brunch at The Kitchen Table at noon – 4pm where the Jingle Bubble Up brunch is offered at only 1,800 THB per person—or 3,500 THB with free-flow Chandon for two hours, or 5,300 THB with free-flow Veuve Clicquot for two hours.